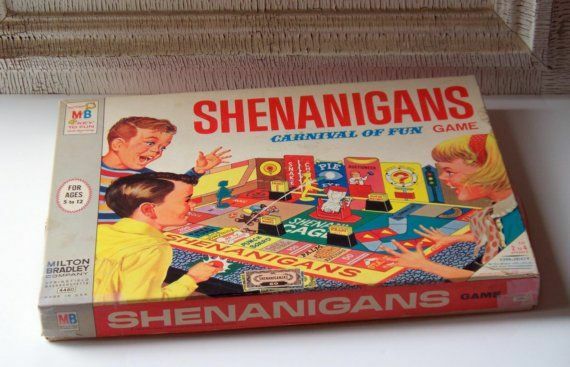 This page is to talk about all the games we grew up with. This is before the advent of computer games, Wii, X-BOX and the like. Let's see what we can find, shall we? 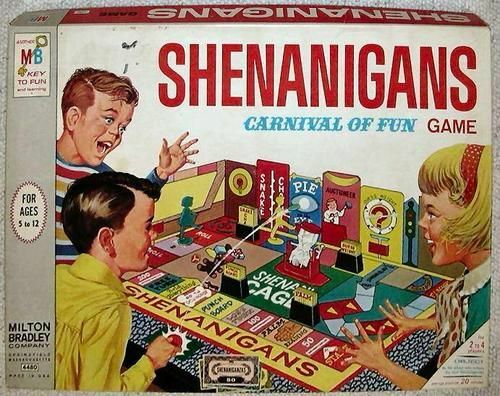 The board looks like a carnival & you "play" different carnival games like Pie in the Eye (snapping a Tiddly Wink through an opening in the 3-D Board), Guess Weight, Balloono, Bowlaganza, etc. 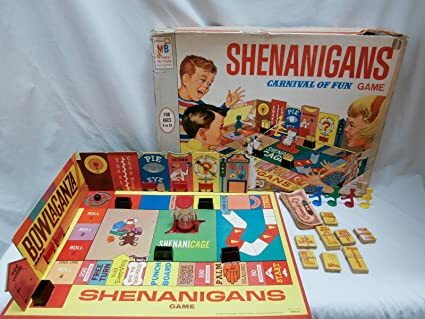 The object of the game is to be the player who collects the most Shenaniganzas (This is the Shenanigan's name for money) as you go through the "carnival" by moving along the board. Mouse Trap (originally titled Mouse Trap Game) is a board game first published by Ideal in 1963 for 2 to 4 players. Over the course of the game, players at first cooperate to build a working Rube Goldberg-like mouse trap. Once the mouse trap has been built, players turn against each other, attempting to trap opponents' mouse-shaped game pieces. 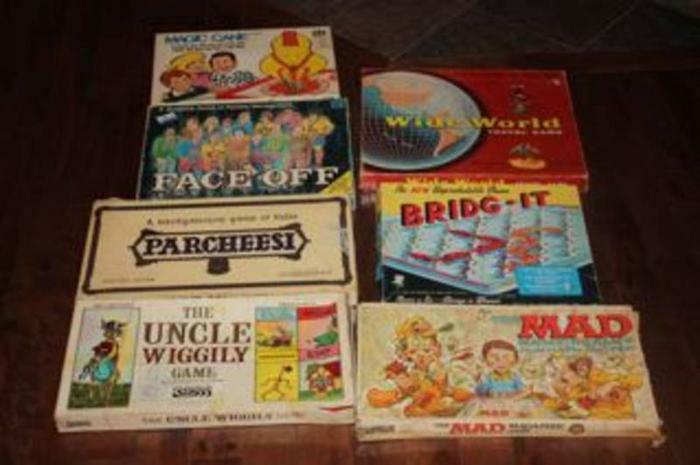 Parcheesi is a brand-name American adaptation of the Indian cross and circle board game Pachisi, published by Parker Brothers andWinning Moves. Created in India perhaps as early as A.D. 500, Pachisi is called the Royal Game of India because royalty used servants of the royal household adorned in colored costumes as game pieces on large outdoor boards. Such a court is preserved at the Fatehpur Sikri. The game and its variants are known worldwide. A similar game called Parchís is popular in Spain and northern Morocco. Parquésis its Colombian variant. A version is available in the United Kingdom under the name of Ludo. 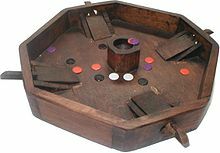 Tiddlywinks is an indoor game played on a flat felt mat with sets of small discs called "winks", a pot, which is the target, and a collection of squidgers, which are also discs. Players use a "squidger" (nowadays made of plastic) to shoot a wink into flight by flicking the squidger across the top of a wink and then over its edge, thereby propelling it into the air. The offensive objective of the game is to score points by sending your own winks into the pot. The defensive objective of the game is to prevent your opponents from potting their winks by "squopping" them: shooting your own winks to land on top of your opponents' winks. As part of strategic gameplay, players often attempt to squop their opponents' winks and develop, maintain and break up large piles of winks. 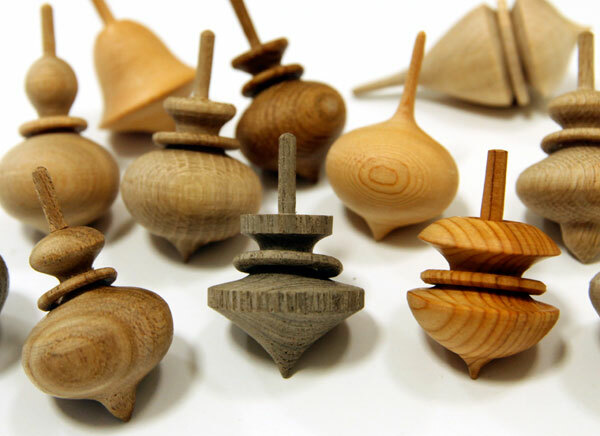 Tiddlywinks is sometimes considered a simpleminded, frivolous children's game, rather than a strategic, adult game. However, the modern competitive adult game of tiddlywinks made a strong comeback at the University of Cambridge in 1955. The modern game uses far more complex rules and a consistent set of high-grade equipment. The rest of this article concerns the adult game. A hula hoop is a toy hoop that is twirled around the waist, limbs or neck. The modern hula hoop was invented in 1958 by Arthur K. "Spud" Melin and Richard Knerr, but children and adults around the world have played with hoops, twirling, rolling and throwing them throughout history. Hula hoops for children generally measure approximately 71 centimetres (28 in) in diameter, and those for adults around 1.02 metres (40 in). Traditional materials for hoops include willow, rattan (a flexible and strong vine), grapevines and stiff grasses. 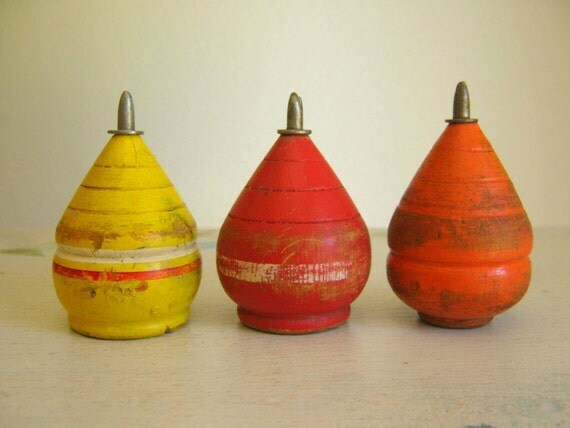 Today, they are usually made of plastic tubing. Slinky is a toy; a precompressed helical spring invented by Richard James in the early 1940s. It can perform a number of tricks, including travelling down a flight of steps end-over-end as it stretches and re-forms itself with the aid of gravity and its own momentum, or appear to levitate for a period of time after it has been dropped. 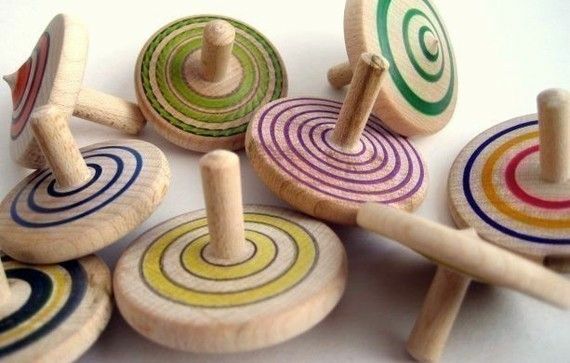 These interesting characteristics have contributed to its success as a toy in its home country of USA, resulting in many popular toys with slinky components in a wide range of countries. 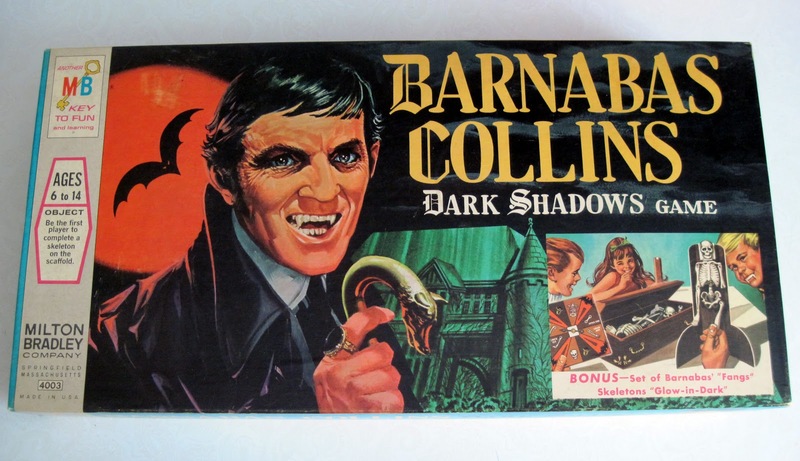 Based on the cult television series, the game comes with a coffin for component storage, glow-in-the-dark vampire teeth (bonus --not used in play), a spinner, some tiny wooden stakes and four sets of glow-in-the-dark skeleton parts. You race to be the first to assemble your skeleton on its scaffold. Spin the spinner and hope to get the correct bone. The ring is wild. When you get a stake, you collect one; if you collect three, you return the stakes and a bone to the coffin. In the advanced game, you have the option of challenging another vampire instead. Both challengers spin in turn, and the first to get a ring wins; if the challenger wins, the loser loses a bone. If the challenged wins, the challenger loses two bones. Description: Glowing spook helps you search for his 12 sons. Unlock pits and find bats, snakes and bones -- let glowing board's eeire flicker guide you. For 2 to 4 players, ages 6 and up. he Green Ghost haunted graveyard game made by Transogram is unique in many ways but most importantly it is the only board game designed to be played in the dark! Several of the parts are made of a special material that retains light and glows mysteriously in the dark. Transogram mass-produced the game in 1965, then sold its toy interests to Marx Toys in 1970. In 1997 Marx Toys produced a 30th Anniversary edition of the game (MCMXCVII, Item #3905). Printed on this version of the box is, "Find Kelly the Ghost... if you DARE". The 1965 box has "THE EXCITING GAME OF MYSTERY THAT GLOWS IN THE DARK."